The jackfruit tree is lovely, with large, oval leaves and straight, regal trunks. In their native tropical habitat, they grow large, columnar trees up to 70 feet in height. The real interest, though, comes from their fruit. The jackfruit is one the world's most magnificent fruit: a single mature fruit can weigh up to 40 pounds. Shaped like an enormous kidney bean, they have pebbled and rough green skin, and their flavor is indescribable. They are sweet, mild, and best served cold. For the indoor gardener, however, the jackfruit falls into the same category as mango, papaya, and avocado. You may grow a jackfruit tree indoors, but it probably won't bear jackfruit there. Indoors, most people won't have room to let a jackfruit grow to maturity and fruit—and it can take up to 14 years for a jackfruit to bear fruit. Still, if you somehow get access to jackfruit seeds, go ahead and sprout them and see what happens. At worst you won't have any fruit, but you'll still have a beautiful and interesting conversation piece! 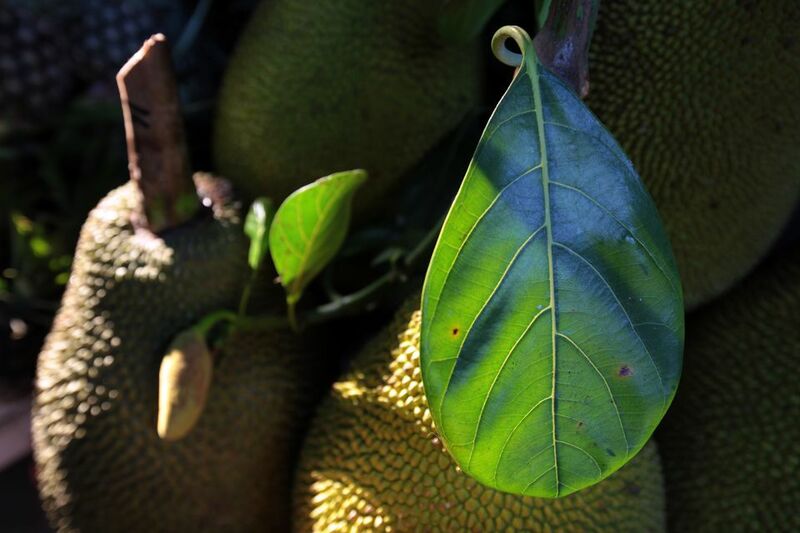 Light: Jackfruit seeds can be sprouted in the spring and immediately exposed to dappled sunlight. They prefer strong light while growing, so move them into a sunny window or outside on a patio deck. They are highly susceptible to cold weather, especially early in their lives, and cannot tolerate frost or freezing weather. Water: As tropical plants, they require a steady supply of ample moisture. Keep them continuously moist throughout the year, including the winter. Jackfruit does not have a natural winter dormancy, so it's best to keep their growing conditions warm, bright, and humid all year if possible. Fertilizer: Feed weekly with a weak liquid fertilizer. It is not a particularly heavy feeder, but seedlings and younger plants especially thrive with regular applications of fertilizer. Soil: Light, fast-draining potting soil is perfect. You can use fortified soils. Jackfruit seeds are viable for about a month after harvesting. Jackfruit seedlings are quite sensitive and do not like to be disturbed if at all possible. As a result, it's best to sprout them in a somewhat larger pot and avoid the early transplanting that many plants require. To increase the odds of germination, soak the seedling overnight, then plant into a sterile seedling soil and keep it warm. Expect germination in about two months, although it may happen somewhat faster. Jackfruit can also be propagated by air layering, although this is a somewhat more advanced technique that requires access to an adult plant and several months. Jackfruit has a long and delicate taproot, which makes repotting difficult. It's best to avoid repotting young jackfruit if it's not necessary. Ideally, you can grow them in the same pot you sprouted them in for the first season. Assuming your plant makes it through the winter, you can repot in the spring again, stepping up one or two pot sizes. When repotting, be careful not to disturb the roots of young plants. Jackfruit belongs to the Artocarpus family, the same family as the breadfruit made famous by Captain Bligh. The main species is the A. heterophylla. According to Purdue University, the origin of the jackfruit isn't known—the plants are widely distributed throughout tropical Asia and India, where they have been in cultivation for hundreds of years. Because they are a commercially important plant, jackfruit has been extensively hybridized over the years. Growers have worked to encourage a variety of traits like early fruiting, late-season fruiting, large fruit, small fruit, and sweeter fruit. Jackfruit is a tropical plant and acts like it. They are not viable outside below about zone 10, and they require lots of water, sunlight, humidity, and warmth to thrive. They cannot tolerate frost or extended periods of drought. Young trees grow quickly under good conditions and if they manage to survive the winters, you could have a nice-sized foyer tree within a few years. If you're very lucky, your tree might even make it to setting fruit! The fruit is typically harvested within 8 months of flowering and can be harvested when green (and treated like plantains or breadfruit) or when they are fully ripe. Young jackfruit trees are susceptible to mealybugs and aphids, so be careful—and happy planting!